At Last! a delicious and a perfect substitute for meat that fills the bill in every respect. Made from sun-kissed nuts, cereals and vegetable products, it looks and tastes just like meat. 50% more nutritious than meat nourishing, wholesome and appetizing. Endorsed by Doctors and Dietitians as a perfect food. Send 60c for a one pound can or $5.40 for a dozen delivered. If not thoroughly satisfactory your money will be refunded. Four flavorsâ€”Plain, Chili, Chicken and Bologna. 1 lb. can sufficient for 8 portions. VEJ-MEAT CO., Box PC, 227 N. Manassas St., Memphis, Tenn.
Meat, of course. 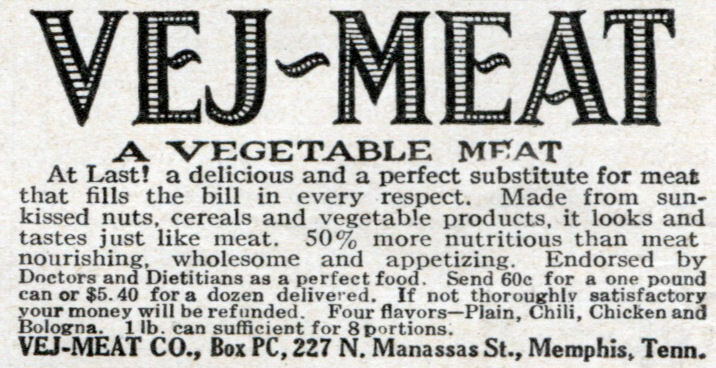 Why would an ad from 1922 lie? Of course, how silly of me. I wonder if it cures Catarrh like everything else in the 20’s did. I love the word catarrh it looks like it needs another vowel. Either that or it w was invented by a pirate. 60 cents a pound? That’s over ten times the price of ground beef in 1922. Heck, today ground beef is only 79 cents a pound (Canadian, at that) where I shop. If the current meat replacement stuff used by vegetarians is any indication, it did not taste good at all. Stannous: Maybe you had to add water? Chicken and bologna, I can understand. Maybe even chili. But, really, what flavor is ‘plain’? That’s too scary to contemplate.